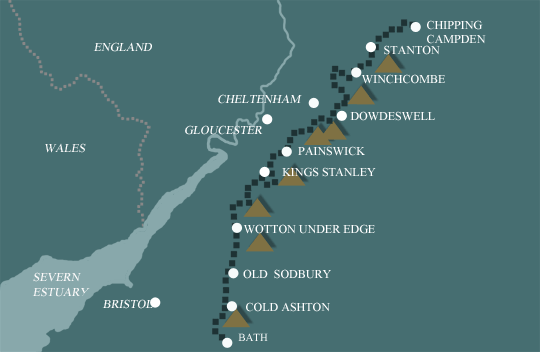 A 9 days walk along the whole of the Cotswold Way path, this walk provides pleasant daily distances so that the holiday can be enjoyed at a slightly more leisurely pace. There will be time to make detours to visit ancient sites and historic landmarks along the way. The Cotswold Way starts at the Town Hall in the centre of Chipping Campden, one of the most charming of all the picturesque settlements along the trail. The route climbs gradually up to Dover’s Hill (230m/755ft) with views over the Vale of Evesham before continuing on to Broadway Tower, the second highest point along the trail at 312m (1025ft). After dropping down into the delightful village of Broadway, the trail climbs back up to Shenberrow Hill before descending into the idyllic village of Stanton. From Stanton the path leads across meadows to the hamlet of Church Stanway. The route then begins its ascent back to the top of the escarpment at Stumps Cross from where it follows an ancient drove road for a while before reaching an Iron Age Hill Fort at Beckbury Camp. The path then descends to Winchcombe where the route skirts the edge of Cleeve Common – the highest point of the trail at 330m (1083ft). In bad weather, or for people with less time, a short-cut can be taken over the Common, cutting about 4 miles off the route. This section follows the western edge of the escarpment with fine views down to Cheltenham and across the Vale of Gloucester. From an Iron Age Hill Fort, the path drops down to Dowdeswell reservoir then follows the scarp to Severn Springs, Leckhampton Hill leading eventually to Crickley Hill. From Crickley Hill the path traverses the combe through woods before arriving at Cooper’s Hill and more panoramic views. Further woodland walking above Prinknash Abbey brings you to Painswick Beacon. From here it’s a steady descent to the lovely old market town. Painswick is about halfway along the route, and many people choose to spend an extra night here to relax and enjoy the timeless architecture. The next section crosses open countryside to Scottsquar Hill, before entering the woodland that leads to Haresfield Beacon. The path then skirts between the towns of Stroud and Stonehouse before crossing the Stroudwater Canal and entering King’s Stanley. Regaining the escarpment by a steep path up to Pen Hill, the way continues through beech woodland until you reach the Nympsfield Long Barrow. Here there are superb panoramic views from Coaley Peak on Frocester Hill. The path returns to the woods with many ups and downs before descending to the small market town of Dursley. After descending to the valley the way climbs steeply again onto Nibley Knoll and the stunning views from the Tyndale Monument. The path continues to traverse the escarpment, before descending into the old wool town of Wotton-under-Edge nestling at the foot of the hill. After a steep climb out of Wotton there is easy walking across gently rolling countryside to the pretty little hamlet of Little Sodbury. After this the way then crosses the parkland of Dodington House, before entering the peaceful village of Tormarton. Easy walking then leads across farmland to Dyrham Park before climbing gently up to the tiny hamlet of Pennsylvania. 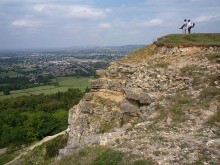 From here the path climbs gradually up to the top of Lansdown Hill. The trail then follows the escarpment again to Prospect Stile from where there are superb views down to Bath before descending to this magnificent city and completing the walk at the Roman Baths. This is another relatively easy National Trail which is clearly way-marked along the length of the path. A good route for people wanting to do their first long-distance walk. Terrain: Varied - but these are gentle wolds and not mountainous areas. The path rises up and down onto the Cotswold Escarpment in the northern section, and is lower, but still undulating over farmland and through woods towards the south. General travel information for the Cotswold Way route will be in your holiday pack including train and bus timetables where available. If you require secure car parking whilst walking this route, please contact us for detailed information. Please be aware that long term parking can be very expensive in Bath. By Air: The nearest International Airport to Chipping Campden is Birmingham (about 35 miles /56km away). Alternatives are London Heathrow or Gatwick. By Public Transport: The nearest Railway Station to Chipping Campden is at Moreton-in-Marsh, which has regular through trains from London Paddington. You can also get to Moreton-in-Marsh by train from Birmingham, Bath and Bristol but will need to change at Oxford or Reading. From Moreton-in-Marsh there are 3 buses a day (Monday – Saturday) to Chipping Campden, or you can get a taxi. It is 8 miles / 12km. Please note that there are no buses on Sundays. By Road: Chipping Campden is on the B4081, just off the A44 which runs between Oxford and Worcester. It takes about 45 minutes by car to either Oxford or Worcester. By Public Transport: From the end of the walk at Bath you can travel onwards by all forms of public transport, as it is well linked. The nearest international airport is Bristol. By Rail: There are fast and frequent services which connect Bath to London (journey time 1hour 30 minutes) or Birmingham (2 hours). You can also get the train to Moreton-in-Marsh to collect your car if you have left it in Chipping Campden, but will need to change at Reading. By Bus: National Express coach services serve Bath regularly. Many people choose to spend an extra night in Chipping Campden before starting the trail, in order to soak up the mellow atmosphere of this charming medieval market town with its beautiful honey-coloured buildings dating back to the 14th Century. It also makes an excellent base for a day trip to Stratford-upon-Avon, Shakespeare’s Birthplace, which is about an hour away by bus, (8 miles/16km) but please note that there are no buses on Sundays. Painswick is a delightful market town, and is perfectly located for a halfway break with its elegant white stone buildings. From here you can visit the Rococo Garden, designed in the 18th century and claimed to be the only one of its kind in England. This is the most popular choice for an extra night or two. This stunning city is designated by UNESCO as a World Heritage Site. The Cotswold Way ends outside the glorious Bath Abbey re-built during the reign of Elizabeth I. From here you can explore the superb Georgian Architecture including the Royal Crescent, the Circus, the Assembly Rooms and the sublime Pulteney Bridge. Or you can discover Bath’s earlier history with a visit to the Roman Baths where you can soak your weary limbs in the newly refurbished Thermal Spa with its spectacular roof top views. Bath is a vibrant city with beautiful open spaces and many other attractions and museums to keep the visitor occupied. It is also renowned for its cafe and restaurant culture.